This article shares four ways we use to produce B2B content marketing videos that increase conversations. In the following example, the problem setup takes 17 seconds, which is pretty good. But the entire content (if you don’t count the introductory logo thing-y, which we don’t) is just under 90 seconds. So 17 seconds is still a lot of time not talking about the solution. Sometimes, you can start the conversation without even introducing the subject. At conferences and trade shows, the same kinds of problems are likely to be top-of-mind for everyone attending. And, it’s the same with industry-niche LinkedIn groups and other social media circles. No one needs to be reminded of what we’re talking about. Is it better to have real people or animation in a video? Or both? Well, there’s no correct answer to that, and a lot depends on your goals, your needs and your budget. 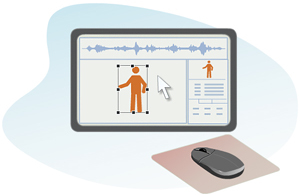 This article explains why animated videos should be in your B2B video marketing plan. However, if you are trying to communicate your solution’s value to prospects fast, and if you are trying to explain a complicated concept — then an animated video may be the perfect choice for your organization. Below, I share with you four reasons why you should consider creating animated videos to use with your sales and marketing efforts. This is a revised version of a video animation of a graphic that appeared in this Gartner blog post. I think most of the team is at the same “place” in the overall flow — versus some late in flow and some early . . . But their focus varies (as described) and they definitely move between streams. So, I reworded part of the script, snipped out part, re-recorded one item, and worked with animator Tony Coccia to move some graphics around and change the animation flow. The new version took less than three hours to get online. The concept of a sales cycle (or process) generally refers to a buyer and the various mental states he passes through on his way to a “buying decision.” But, should we focus on a “buyer” or a B2B buying team. B2B Buyer or B2B Buying Team? “Teams, Streams, and Provider Dreams” by Gartner analyst Hank Barnes suggests a different way to think about the B2B technology sales cycle. This short video attempts to capture the main ideas expressed in Hank’s post. An intriguing post on Gartner’s blog suggests a different way to think about the sales cycle for B2B technology. Titled “Teams, Streams, and Provider Dreams,” their post offers a high-level view of findings from Gartner’s recent Research report “The B2B Customer Buying Cycle for Technology Products and Services” [subscription required]. Initially drawn to it because the author is a long-ago client of ours [on this project], I was so intrigued by his re-imagining of the tired old “buying cycle” graphic. And, as I am convinced that you, the reader, would be too, I decided to make the illustration of the concept easier to grasp (it took me a while to figure it out) with some simple animation. B2B technology marketers, especially those with SaaS and cloud-based software solutions, like to feature “DEMO videos” prominently on their web sites and landing pages. This makes sense if the website visitor is the same person who is going to be forking over the subscription fee. But that person is probably going to need reasons to buy before anything else. If you want to make videos for top of the funnel prospects who are just beginning their search, your initial videos should be anything but an actual demo. This article will provide several examples of technology video “demos” that convert prospects to leads. For example, in the lean manufacturing video below the challenge action is all about what the software can do, rather how you would do it if you controlled the mouse and keyboard. B2B story telling videos or software demos? Everything else is data-driven these days. Shouldn’t software demos have plenty of data, too. A recent BtoB Magazine article showed that 47% of B2B marketers favor product demos as a lead generation strategy. 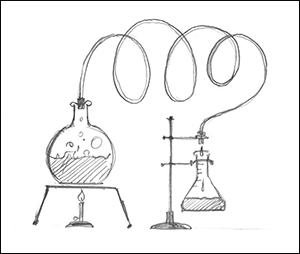 This may be effective in generating leads — but what about conversions? B2B story telling videos or software demos? Where should your organization be investing your marketing budget? Through our work with 100 or so technology companies like BMC, Brocade Networks, UPS Logistics, Sterling Commerce (an IBM Company), Taleo (an Oracle Company), we have seen a lot of software demos can only be characterized as lame. We most often think of short videos in the context of outbound marketing as they are included in most product introduction packages. After all there’s no quicker way to communicate essential features, benefits and points of differentiation. But, what about using short B2B content marketing videos to change perceptions – instead of focusing on features and benefits. Below, we show how two companies are building video marketing content around ideas. Not all technology solutions are products with features. Sometimes the marketing task is to introduce an idea, or to get an existing customer to think about solutions in a different way. Compuware, a large (~$1B sales) U.S. software company, has been a top provider of tools for mainframes since the 1980s. Now, Compuware is big in mobile solutions, application performance management, cloud computing, services, and lots more. The company now puts a good deal of effort into thought leadership campaigns. Their “thought leadership” video was designed to divert thoughts toward Compuware solutions and capabilities the viewer may not be aware of. Hence the diverting style. This particular video saw its first use at Detroit’s OpenCo Business Conference and will find its way into many other venues and content collections as time goes by. The most important constraint on the length of a video message is the number of words spoken. But it can also be helpful to consider different shapes for the message container. Here are some ways that we condense our clients’ product information and marketing messages in a two-minute or less video. Stories draw people in. With a lifetime of watching TV commercials behind us, most people know that two minutes is more than enough time to tell a pretty good story. Of course the story in TV commercials is usually about love, happiness, or, having a good time. Payoffs that are appropriate to B2B solutions — ROI, agile operations, customer satisfaction — don’t resonate in the same way. This may be why music tracks in B2B videos often sound inappropriate or even cheesy. Nevertheless, shaping a story to fit the available space usually works. 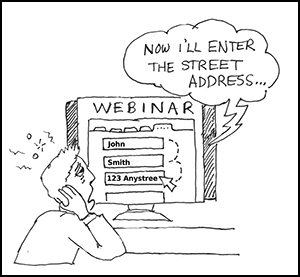 Here’s a story about trying to identify a retail store (bricks and mortar type) customer online. Where do you find stories? Sales engineers, account reps, anyone else who spends a lot of time talking to customers. This article will share what I think is the essential information to include in a two-minute B2B video. So, first, it’s important to define the “me” you’re talking to. This is often done with a character (“This is Mike, the CIO”). This works particularly well if the solution you’re pitching is to a problem that is subtle or overlooked. A more general way to enable a person to see himself in the picture is to indicate the common pressures and problems your solution addresses. Promises such as “increased productivity” and “lower costs” are tough to deal with because they are among the benefits of technology in general, and all B2B technology products I can think of promise them. On the other hand, if those are the main benefits, you cannot not mention them. But if you’re aware that you’re dealing with what goes without saying, you’ll put more effort into graphics and animation. Showing specific costs being knocked down, or employees reassigned to more mission-critical work (e.g., from maintenance to develop and test) is more interesting and persuasive than mere talk about productivity and savings. Let’s say your target audience is compliance officers. The last thing they need to hear is that the consequences of ineffective compliance include loss of company reputation, customers taking business elsewhere, failed audits, heightened regulatory oversight, fines, penalties, and possibly people going to jail. 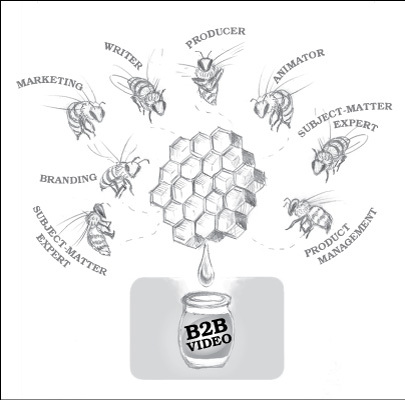 B2B video is as much a business process as it is a creative process. Like many business processes today, there’s an ad hoc team on the case. Good teamwork comes about when everyone on the team is doing work they are good at. So I prefer a process that is as close as possible to WYSIWG, where everyone can respond based on what they know, not what they can envision (based on, say, storyboards). B2B videos are always a team effort. So it’s best to have a process that gets the most out of teamwork. Teams we work with generally consist of one or two marketing execs, a product manager, and several subject matter experts (SMEs).